My kitchen is 8 yrs old, so no way was I ripping it out. 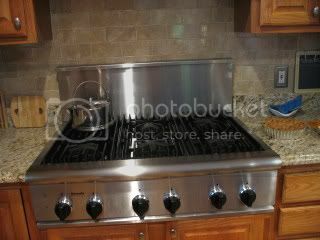 I kept my Thermador ovens and stove, and I have 2 Bosch dishwashers, that are just fine, thank you! You can see the BEFORE sink area in this one from a few years ago.. Here you can see oak moulding has been added..
Moulding stained and you can see the granite.. When we replaced some of the doors with glass I saved the doors and had them installed on the ends of the upper cabinets to dress them up.. 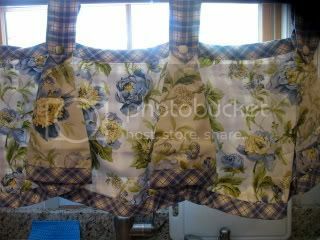 I found these Waverly valances at a great price in the Christmas Tree Shops..
Across from the island is my desk area, I am still waiting for my shelf to go up, so I can move my cookbooks there, making more room in the cabinets for..well, dishes I guess! 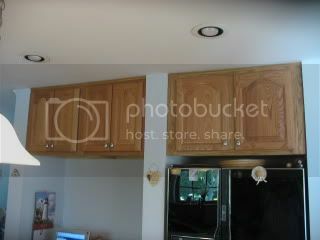 These cabinets were installed, and filled ! We are shopping for a new SS frig..waiting for a good sale.. I know these pics aren't great, but you can get the idea.. Please join Susan to see the other entries this week.. Please join Mary at Little Red House to see the other mosaics..
Love the little things you did in your kitchen. Your idea to put the doors on the cabinet ends is great! A "little" whipped cream she says. Ha, I want dessert at your house. The kitchen is lovely. A little molding is like putting on lipstick. It just finishes off the look. LOVELY kitchen -- it turned out great. The molding and the granite really dress it up! 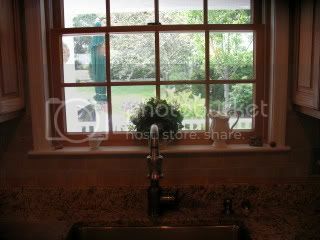 Cass, when we built this house 8 yrs ago, that was what they were showing..I had the room, so I went for it..Supposed to be good for resale value..
And it is wonderful with company..no back up of dishes on the counter..
After dinner parties, the dishes and glasses all done at once! The kitchenlooks wonderful, Kathleen! I didn't know you had 2 dishwashers either - lucky you! Yes, for parties when you have the whole family they must be wonderful. The moulding, granite and back splash all look great. Wow, 2 dishwashers - that is awesome. I love the subway tile - a perfect choice! I'm going to have to bookmark and come back here - there seems to be a lot to look at! Your kichen is fabulous, Kathleen!! It is so much fun to re~do or switch things around in the kitchen because it is a room that is truly The Queens!!! I love what you did with the cabinets and island. Your subway tile looks fantastic. I just re~did my kitchen at the lake and I used white subway tile. I love how shiny it is. I like the Waverly curtains too..so elegant! 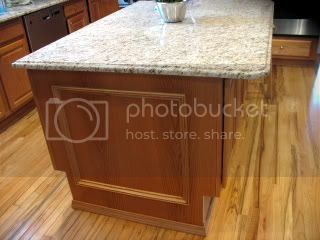 Although my kitchen is far from done, I am going to post some pics later this week. I'd love to hear what you think. BTW. Where in the world did you get those star shaped plates in your header. I LOVE them!! Lovely metamorphosis ... But, I think your kitchen was lovely before. I'm sure that you're enjoying the new finishing touches, AND that's what counts. I think picking out backsplash tiles is one of the hardest decisions to make in a kitchen. You did well! I love the whipped cream mosaic. I think I could finish off all of yours in one setting. Do you have 14 children? Cabinet doors on the ends of the cabinet! Aren't you clever! Kathleen, your trim looks beautiful. I like the idea of using the doors on the cabinet ends!! Loved the transitions -- especially the backsplash. 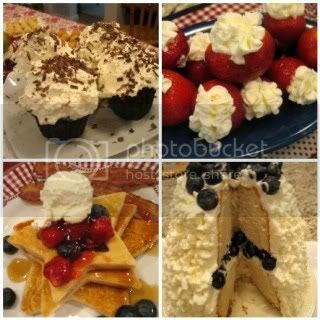 A whipped cream mosaic is a pretty darn tasty subject and you are making me hungry for the strawberries and blueberry filled cake! I love your kitchen...I bet you have a drawer for white napkins !!! 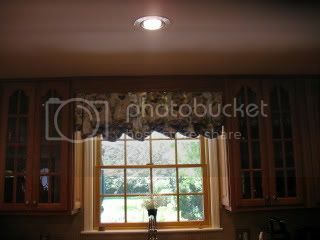 I got a new kitchen and just got it done....will show off after I finish a few decorating touches..maybe white napkins..LOL ! No, don't have them , drats ! p.s. love all your wood - I got real wood in mine too ! What a GREAT Kitchen makeover. We are in the planning stages of a major Kitchen renovation and I love to see the Kitchens of others for inspiration. Thank you so much for sharing. AND...be still my heart...I LOVE WHIPPED CREAM!!! Girl if anyone deserves a good kitchen you with all your cooking skills do! Love your stove top!! The changes you made are great! Yum!!!! love your mosaic of little goodies! & Your kitchen is AMAZING!!! Kathleen, the kitchen came out great! Love the cabs and granite! So I assume that is not reddi-whip from a can? Fun mosaic! 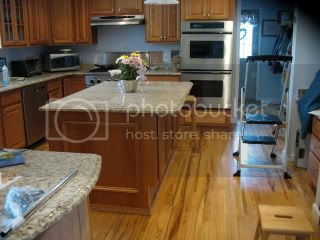 Such a great kitchen transformation, Kathleen! Love the sink and the granite and the moldings! Very elegant! 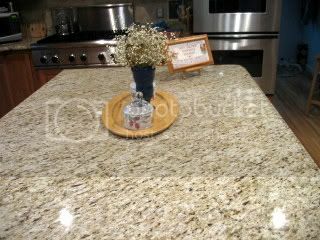 Your kitchen remodeling job turned out beautifully! 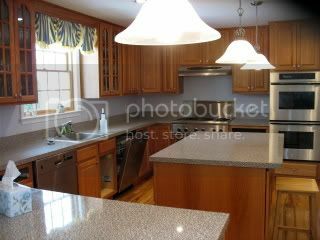 It just proves you don't have to rip out the cabinets and replace all of the appliance, or demolish the place, to completely overhaul a look. 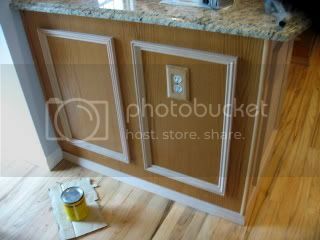 The counter is fabulous and I love the addition of a little bit of moulding to spruce up the cabinets. Wonderful job! Thank you for sharing! Ooo, and you kitchen looks amazing! Kathleen, I love the new look, but loved the old look too :-) And I didn't know that you had two dishwashers. I would have sent my dirty dishes to you after my dinner party! One is not enough in my household. You "whipped" up a great mosaic too! Great posts! Wonderful trip to Greenport. Love the updates to the kitchen - so that's where all those goodies come from! And your mosaic just pushed it over the top! 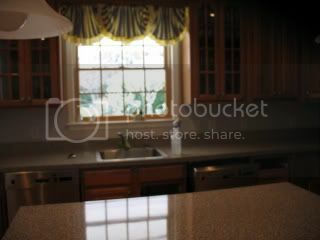 Kathleen, love the kitchen and your CIJ table is so sweet! I love both! Btw, did I miss the other "white tablescapes" event? If I did, I'm so sorry and please, please, let me know when the next one is, ok so I can put it on my What Now? blog sidebar. Your kitchen redo looks awesome! I love it all! The granite is so pretty. 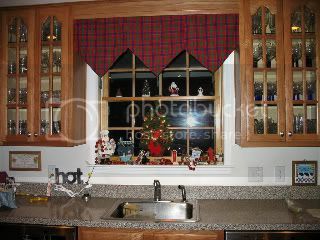 Really cute valance, too.